The Bible. The Word of God. It is living and active, sharper than a double-edged sword. It contains all we need for life and godliness, inspired by God and profitable for teaching and rebuking and correcting. Eternal. It is a lamp unto my feet and a light unto my path. It is nourishment for the soul. So much of my life, the desire to spend time studying His Word has been less than lack-luster. Oh, I've had seasons that have been marked by a hunger for this nourishment. In my early teens I would set my alarm extra early so I could wake up and start my day being washed in the Word. Sophomore year of college, I was constantly running to the Word because it was the only sure thing. There were other, shorter seasons of this as well, but far more often, it has felt like a duty, a task to be finished or procrastinated. I've always wanted to hear from God, hear His voice, know His heart. I have not always wanted to seek it out. And most of my time in scripture was not for my own relationship but to teach it to others. This past summer, I took 84 students and 29 adults on a mission trip to New Mexico. We were planning to serve at 4 locations, but when we arrived our host informed me that they wanted to add one more and I would need to decide which group to send to Los Lunas Church. The next morning, the red team headed out to Los Lunas to paint a church rather than to VBS. They were a little unsure about what the day would hold and I think were a bit sad about not getting to be with the kids, but they went with great attitudes. That afternoon they returned with even better attitudes. Liz came and found me to tell me we needed to send as many groups there as possible. She told me about Sister Rebekah. This lovely woman had pulled a couple of girls and Liz aside and spoken a word to them that she felt was from The Lord. Based on their reactions, I was pretty sure it was from The Lord as well. I've never really experienced someone speaking over me like that, so I didn't know what to do with it but be pleased that they had a good day. But, I took Liz's advice and started sending 2 groups a day. The last day, the pastor of this tiny church had invited our entire group...114 people...to a homemade, authentic Mexican dinner. We came and they served us, their kids played basketball with our kids, they sang for us, and then we all worshipped together. It was a fantastic night, mutually uplifting. I would occasionally glance over to find this little white-haired woman holding the hands of a leader or a student, her eyes shining with joy and tears of sincerity, leaning in to tell them something just for them. It was hard to not be curious. I wanted to know what she was telling them and I wanted her to tell me something. It came time for us to return to our host site and say goodbye to this little band of Jesus-worshippers. We headed out to the vans and as we did, Sister Rebekah stopped me and asked my name. Then she hugged me, took my hands to thank me for coming, and then paused there, holding my hands and listening for something. She started slowly, almost unsure if she was hearing correctly. As if she didn't want to relay the message incorrectly. (Like a game of telephone that could change a life.) She spoke a word over me, one that I won't share here except to say, it was a word that fit perfectly into the cracks my fear had been creating in my heart. I told her how much her words fit, that they were the exact words to fight the exact fears I was feeling. Then she paused again. "Wait, I think there is more He wants to say." This was a long pause, y'all. And I was supposed to be getting on a van with my group. It was awkward...and beautiful. You don't rush God. You don't rush someone listening for His voice. She looked up at me again, very intently. "Do you love God's Word?" I answered yes...a halfhearted yes. A yes that contained years of wanting to love His Word, but fighting my tendency to put other things first. A yes but I don't know how to love it. Then Sister Rebekah squeezed my hands, "Press into it more. He is going to reveal deep mysteries to you." Y'all. I think I stopped breathing for a minute at that. God is going to reveal deep mysteries to me? I know He wants to do that for all of us, but to have it spoken straight to me is different. I didn't really know what to say. We just hugged and then I left. And so, I came home, ready to dive in. But where should I start? I was almost frozen with uncertainty. Did I need to do something special? Could I just pick a page and start reading? I've never really been hindered by those questions in past seasons of delighting in His Word. I just would jump in. But there was more at stake now...as if I could mess up His promise to reveal mysteries to me, if in fact that was a word from Him. In August, while spending some time with my friend, Julie, she told me about this blog she had come across where this super crafty woman had begun art journaling IN HER BIBLE. I was immediately intrigued. I went home and looked it up: Journaling Bible with Shanna Noel. My heart stirred. I decided to test the waters. I wanted to dive in, but my creative skills had grown a bit rusty and creating art right on the pages of scripture felt...well...like my grandma might take a ruler to my knuckles (even though she hasn't ever done this). I started slow...in Titus. A tab here, a sticker there. And I was hooked. But, it was on the creating. I was hooked on bringing my whole self to the Word. I didn't feel that I had to check my creativity, my strategic-brain, my daydreaming at the door. Every part of me was engaged by scripture. Every piece of me could interact with God's Word. 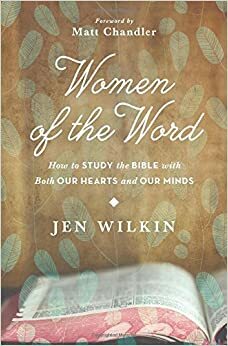 Then, at my next hang out at Julie's, I learn about Women of the Word by Jen Wilkin. I read it last month and, even though it wasn't new information, it sparked something in me. Jen talks about studying the Word with 5 "P's": Purpose, Perspective, Patience, Process, and Prayer. She talks about reversing our norm. We tend to read scripture to learn about ourselves, our lives, our circumstances, what we should do. Instead, scripture wants us to see God, who He is, His heart, what He does. And that in turn will inform our lives. She walks the reader through studying the context of scripture, where does it fit in the big picture, who was the original audience, etc. As I have begun practicing these things, God's Word has become much richer. Even to the point where, while listening to a sermon, the pastor can be making one point and because I'm learning to be aware of context, my brain is discovering a thousand other truths along with the sermon. It isn't distracting. It is enriching. And then, if that weren't enough, Breakaway Ministries released an app and as part of this app, there is a video series that teaches how to study scripture in depth. Ben Stuart walks you through Philippians, teaching you how to break down verses, consider whole thoughts, get the word into your veins. Again, it isn't new to me, Ben actually taught me all of this when I interned with Breakaway Minsitries. But, in this new season, perhaps it will unlock new doors. And Desiring God has also been creating some short videos to help people learn to study The Word for themselves: Look at The Book labs. I've watched one...it is amazing how much truth is packed into one little verse. So, in June, The Lord whispered a promise to me through Sister Rebekah. And in the months following, I have watched as He has given me tool after tool to help me uncover those mysteries in scripture. I am learning to love His Word again. I am discovering that it is more than a duty, more than a counseling session, more than a lesson to pass on...it is life-giving. It is living and active, sharper than a double-edged sword. It contains all we need for life and godliness, inspired by God and profitable for teaching and rebuking and correcting. Eternal. It is a lamp unto my feet and a light unto my path. It is nourishment for the soul.